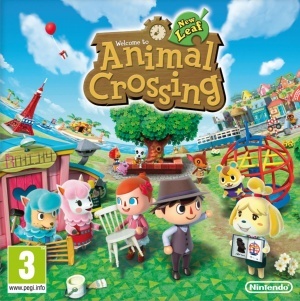 Animal Crossing is a video game franchise by Nintendo that also has had an anime film. Though bathing is never seen in any of the games you can get different types of Bathtubs in your houses through later installments in the series although you can't use them. Bathing is mentioned by some of the animal villagers. Five different colors for "Claw foot tubs" that you can get. There is an image showing Tom Nook taking a Money Bath in a Clawfoot Bathtub. Clawfoot Bathtubs are titled as "Claw foot tub" in the games and the type of clawfoot bathtub they are is a Slipper Bathtub. English localization changed all names of the bath house objects into "Spa" objects. Super Mario Bros. - Both series by Nintendo and objects from the series appear. Legend of Zelda - Both series by Nintendo and objects from the series appear. This page was last modified on 29 August 2018, at 11:39.